Explore the wonders of Nova Scotia at the Museum of Natural History. See stunning Mi'kmaq artifacts, sea creatures, live frogs, and more! Interact with the Netukulimk exhibit and learn the sights and sounds of Nova Scotia's forests or explore space with Science on a Sphere. No visit is complete without stopping by to see Gus the Gopher Tortoise, who has been delighting Museum visitors for more than 70 years. 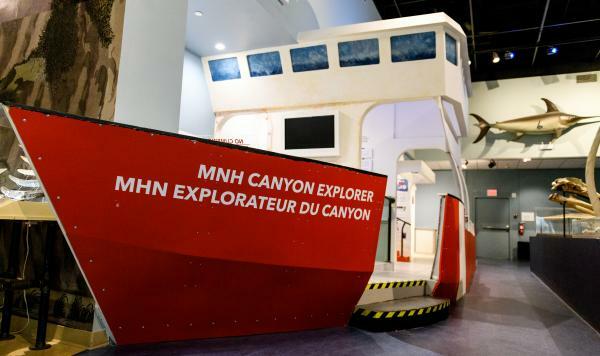 Scavenger hunts of the Museum’s permanent exhibits are available. Please enquire when booking your self-tour. Self-tour groups are welcome to take part in any public programming. Visit our Daily Events page for program information. Groups can be any size but must be 10 or more individuals for a group rate to apply. The cost for a group of youth aged 6 – 17 years old is $3.00 per youth (taxes included). Teachers are admitted free as well as one chaperone for every five students (1:5 ratio). Teaching assistants for special needs students are admitted free of charge and are not included in the total count of chaperones. Extra chaperones beyond this ratio are charged $5.25. The cost for a group of adults aged 18+ is $5.25 per adult (taxes included). Payment can be made by cash, cheque, credit card or invoice. Invoicing must be arranged at the beginning of the booking process. Cheques should be made payable to the “Minister of Finance”. Please ensure only one transaction/payment per school or group. We request that you enter the museum and pay before unloading from the bus. Teachers are asked to advise the chaperones that they must stay with the group of students assigned to them at all times. Chaperones and teachers are responsible for the safety and/or behaviour of students during their visit. There is no food or drink in the museum galleries. Running is not permitted in the museum. Our live animals are always a favourite! Get up close but please no tapping or banging on the tanks. Please no flash photography of the live animals. Our multi-purpose room may be available for your group to have lunch, however this is only by prior arrangement. Visitors should not bring meals that require heating. Please ensure all garbage and personal belongings are removed before departure. In fine weather our fenced in backyard is a great option. Male, female and accessible/family washrooms are located on the lower level of the museum. The museum gift shop is located near the reception area, to the right as you enter the museum. For schools, the museum enforces a limit of 5 students at a time in the gift shop and they must be accompanied by their designated chaperone. The Museum of Natural History has a pay and display lot on site which is administered by the QE II Health Science Centre. This is a public lot and is frequently used by Museum visitors and those visiting the area. In addition to the Museum's parking lot, there are numerous parking meters surrounding the Museum. Museum staff will greet you at the admissions desk upon your arrival. Please have an accurate head count of the group (including adults, teachers, EPAs, chaperones and students). This information will be required to process your payment. Coats, backpacks and lunches should be left in the coatroom or as indicated by museum staff.